My lovely friend Lone (yeah, another one of those Danish names, ha) has one of the most fascinating jobs I know about. She is a dressmaker (with specialty in costumes) at the Danish Royal Theatre (the link should take you to the English version - otherwise look for the little flag in the right top corner to change it). The theatre was built in 1748 so you can probably imagine what an impressive and fascinating historic place this is. All the amazing people working there are the very best within their specialty and all with an amazing passion for making sure to turn the different play's costume designers' visions into absolutely stunning and long lasting costumes. But also costumes that can be danced in AND easily altered if a new actor/dancer/singer has to take over. Yeah phew, that's a lot of criteria for one piece of clothing. I think you have to have an extra amazingly patient personality to do these things. Personally I would cry if I had to spend weeks on the same piece of clothes, I do not have the patience for that, and that is what makes these ladies extra fascinating. I cannot get enough looking at their work....it truly is wearable art. Lone is the type that everything she decides to do turns out perfect. Yeah...it really is lucky she is such a sweet and hysterically funny person because otherwise I am not sure I could stand it, ha! Okay, I think it is time to hear what Lone has to say, right! My name is Lone, I'm 38 years old and married to Jesper and we have two kids - Laust who is nine and Ella who is 5 1/2 years old. I am a formally trained dressmaker. 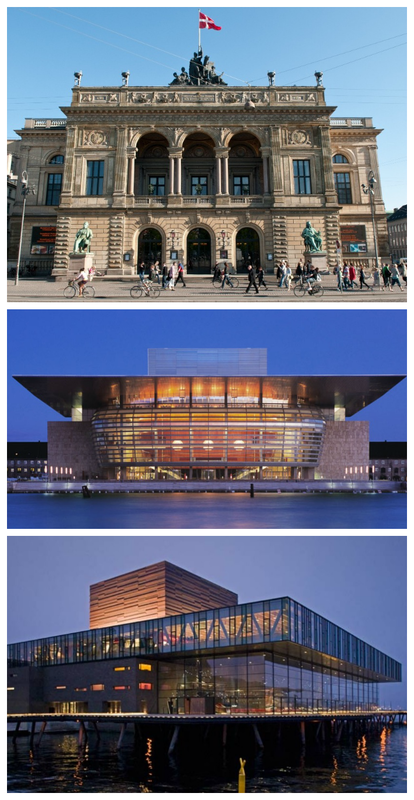 During my education I was lucky to become a trainee at The Royal Danish Theater, and I am still here today 14 years after. *(A super quick explanation of the difference in the two lines: Dressmakers sew custom made clothes using traditional tailor techniques and lots of hand sewing. The finished clothes is made to last a lifetime. The seamstress/sample machinist learns to sew all types of ready-to-wear clothes using industrial/modern methods. In the costume department we are approximately 35 dressmakers, tailors (men's wear), textile color experts and miliners whom as well as hats do jewelry, flowers, masks and everything else wired and wearable that nobody else seems to be able to make. Lone told me this photo is a rare opportunity to see the tutus hanging the right way around. Normally they are being stored upside down so that they keep looking like this above when the ballet dancers need to wear them - year after year. amazing costumes and my days at work are rarely alike. One day I make leotards and those kind of basic costumes for the ballet dancers, the next I make delicate ballet costumes in ultra lightweight silks. Other days I work with stiff flat tutus, heavy opera costumes and delicate historical costumes for plays.....aaaand then of cause there are the days where we maintain up to 30 years old costumes, which has been worn hundreds of times, and still look amazing on stage. But the variation is great and the best thing about it all is that we, because our costumes has to look great on stage for many many years, needs always to be sewed in really good quality materials. A thing that makes sewing of theater costumes special is, that it has to be able to be changed to fit another artist in a hurry (for example if a ballet dancer get enjured and another dancer has to take the part). We have certain techniques and ways in which we sew. And here one has to remember that even the lightest and most delicate ballet costume is work-clothes in which the dancers will sweat and really wear out. At the same time we strive at making our costumes really nicely and that the details are really well made. We sew a great deal by hand as well. It is for example easier and less time consuming to replace one hook sewed in by hand than if we used those premade ribbons with rows of hooks already pre-attached. If there are beads on a costume it is very important to hand tie every single bead separately. We have to ensure that if one bead goes loose during the play/dance, twenty beads will not fall of as well and cause an accident on stage, etc. When all the good things about the crafts are said, I have to say that the work environment is not bad either. I have the greatest colleagues (she is right, I have met a lot of them - funniest ever. Edited to add.). And who would not love to pass the studios every morning and see the dancers do their morning ballet classes and rehearse the different shows to the sound of live piano music. I actually think it would be hard to find a more attractive place for me to work in Denmark. I actually have my dream job here. The only other thing I could dream of here was to try to work in a place where they make real haute couture. Without all the theater techniques and in a more light and fashionable style. For example the Danish designer Ole Yde, who makes the most delicate and beautiful things. Should I dream of something even bigger of, it would of course to go to Paris to work for one of the great fashion houses. Or the Comedie Francaise (in Paris as well) where they sew in correct historical ways to Moliere-plays or Cosprop in London where they also do everyting 100% correct historically - (for example no overlock - everything is sewed by hand - only straight seams on machine) They deliver costumes to big film productions all over the world for example the Jane Austin-movies like Sense and Sensibility and Hollywood-productions like Pirates of the Caribbean. With my work we have visited both Comedie Francaise and Cosprop and....Oh boy....we were in sewing heaven. TOP: Femke Mølbach Slot in a dress that Lone has made for the Frank Sinatra play Come Fly Away. MIDDLE, LEFT: Front of a wedding dress. MIDDLE, RIGHT: Detail shots. BOTTOM LEFT: Lady Marion in Robin Hood. BOTTOM RIGHT: Back of the stunning wedding dress. TOP: The original Danish Royal Theatre (now mostly used for ballet and where the costume department is). MIDDLE: The Opera House. BOTTOM: The Acting House. The Opera and Acting house are both fairly new buildings - as I am sure you have already figured out from the architecture. Lone THANK YOU for sharing your job and passion with us! You and your colleagues are nothing less than AMAZING! After this posted I got a question about how they keep the costumes clean? Good question since they make them to last for years! 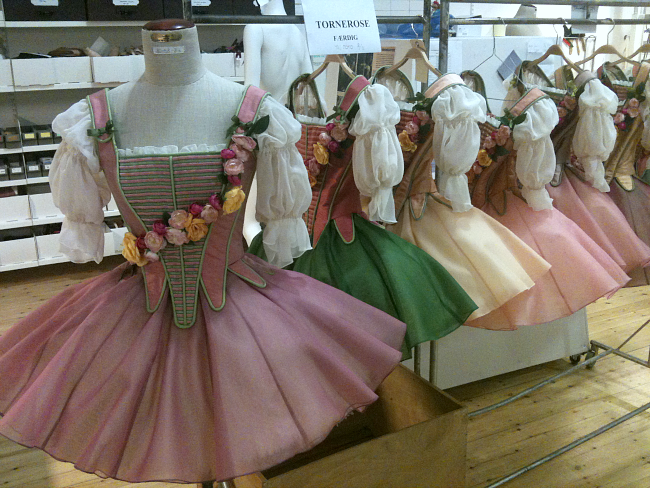 "All the costumes gets dress shields sewed in and they are being replaced as soon as they start to smell. Sometimes the inside of a costume is being taken out and sent to dry cleaning. They also have something called an ozone cabinet (I really hope I am translation this correctly). It sort of sterilizes and send a lot of air thought the clothes. Only problem with that cabinet is that is ruins all elastics, so that would need replacing afterwards (if the costume has elastic). Some costumes they also sew with a little removable/washable shirt inside. They are also asking the actors to wear thin t-shirts under their costume." Next week we are meeting Stine who has started her own women's clothing line The Baand together with a friend, making high quality fashion basics with eco-friendly materials in a sustainable production in Nepal and Peru. Amazing post! Wow, such talent and amazing costumes!! Wow! What talent! But my one question is how do they clean the costumes? So Lone told me she could write a whole novel about this subject.....but she promised to give us a few lines about it when she had a second this weekend. What a dream job! I can't even imagine. I just love this series Mie!! Especially this post. I was a ballet dancer for 16 years and it was my whole life. I didn't care about anything else. I went to New York and studied there for a little bit. I miss it so so much. This post almost had me in tears I miss it so much. I will be signing my daughters up for ballet classes soon and I am so excited. We have been having our own ballet classes at home and they just love it! Thank you for putting on such an inspiring and informative series. Others have said it before but, wow. What a joy to be able to do such work for a living. Out of all that I think I was most impressed with the hand sewing on the hook-and-eyes in the photo. Mine, uh, don't look like that. What a fascinating interview! Lone really does have an incredible job! I don't think we have any formal sewing training programs like this in the US. We have fashion design, which I.did, but it doesn't teach how to sew really, which is a shame. I'm loving this series. 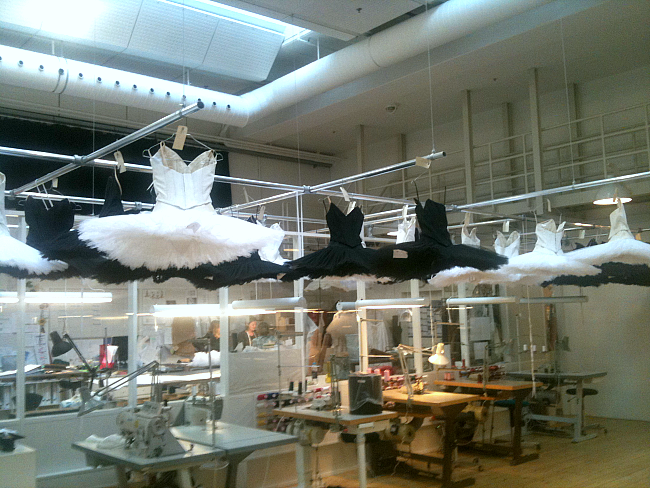 Did you know visiting the Dancing With the Stars costume room is on my sewing bucket list? So, this post totally made my day. Totally amazing! Seriously, sewing every single bead on by hand?! My hero!!! Wow! Amazing. The costumes are all work of art! that was a great read! So fun to learn about how this is done. Why don't we have programs like this in the USA? Or at least, if we do, where are they? The seamstress versus dressmaker programs, I mean. Do you have to go to fashion school? Is that where Americans learn these skills? Wow. Thank you for sharing (both of you!). Those costumes are stunning, I cannot imagine hand beading some of those! Wow, as I gazed upon the corsets and layered tutu's, I felt my spirits lift like a ballerina leaping gracefully through the air. This whole post makes me so happy. Thank you very much for sharing! Industry Insiders - Rikke, Technical Designer. Shades Of Me - Green.